Test scores dropped more than one point for each extra minute it took middle and high school students to complete a 1-mile run/walk fitness test. 65% of the students were below the state fitness standard. Compared with these students, students who met or exceeded fitness standards had higher average test scores. Overweight and obese students also scored significantly lower on tests. Schools may have to reverse their recent disinvestment in physical education ostensibly for the purposes of boosting student achievement. 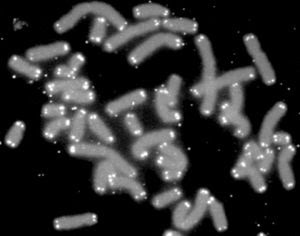 Exercise slows telomere shortening (and aging). Telomeres are the chromosome tips which shorten each time a cell divides, making them a possible marker of aging. A study of 2400 twins showed that physically active people had longer telomeres than sedentary people. Physical, academic fitness tied at the hip: study. Reuters, 2010. The Journal of Pediatrics, published online January 25, 2010.